Deep upper-level low will form over the south-central US later this week and only slowly works its way to the east coast during the upcoming weekend. 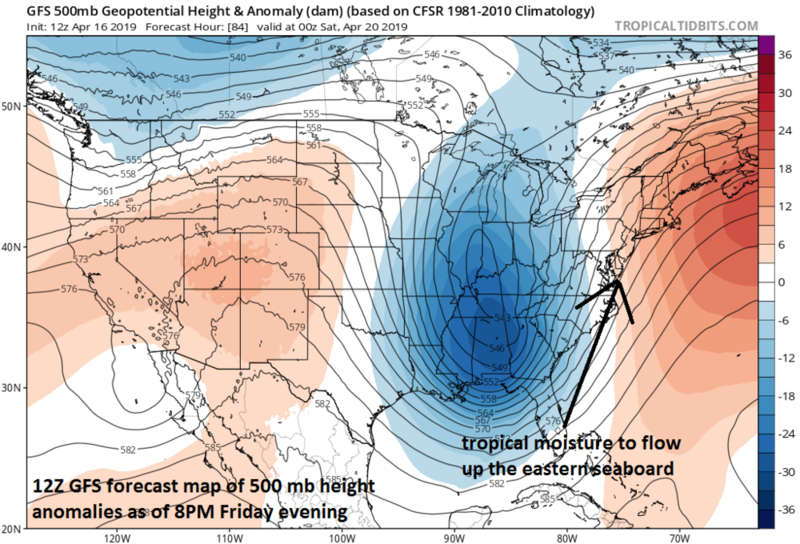 A strong cold front associated with this upper-level feature will grudgingly works its way to the eastern seaboard and this slow movement and strong upper-level support will combine with an influx of tropical moisture to raise the chances for a major rain event in the I-95 corridor from later Friday into early Saturday. Much like the weather event that took place here during the wee hours of Monday morning, this heavy rain threat will likely include some strong-to-severe thunderstorm activity. Furthermore, as was the case early Monday, this upcoming severe weather threat may very well include isolated tornadoes as many of the same instability factors will be in place. The threat for severe weather associated with this upper-level low will begin on Wednesday afternoon across the south-central US. This threat zone will then shift eastward to the Southeast US and Tennessee Valley on Thursday and finally to the east coast later Friday into Friday night. Given the threat for heavy rain, flash flood watches and warnings may indeed become a factor once again as grounds continue to be well-saturated. With the upper-level low still to the west of the I-95 corridor on Saturday, skies are likely to remain mainly cloudy in the I-95 corridor and instability showers can develop. By Easter Sunday, this upper-level low will begin to weaken as it pushes towards the western Atlantic and skies in the DC-to-Philly-to-NYC corridor are liable to become partly sunny although a couple of showers cannot be ruled out.